[three days later] You’d be surprised how much cereal a toilet can hold! Oh, did you think that Entertainer Esmé’s sinister plan to win Derek’s love by locking his wife Katie in a Haitian bathroom failed just because Derek quickly found and rescued her? Well, you’ve got another thing coming! Look at the sinister, knowing way she’s gazing down at the grateful but rattled Hoosiers. Obviously she never expected Katie to stay in that bathroom for long. Obviously that was just the first move in a very long game of sexual chess that ends with Derek as her lover. I remain extremely here for this storyline, is what I’m saying. I don’t really keep up with the “game show scene” so I had to actually Google to see if Can You Top This? were a real game show. It’s not, unless you want to count an “unrehearsed” “radio panel game” from the 1940’s “in which comedians told jokes and tried to top one another”, which, around here we call that a podcast, not a game show. Anyway, it took me a minute to realize that, unlike poor Bubba Watson, Drew Carey isn’t quite being referred to by name here, which makes sense because you’d think drawing a public figure presiding over a game show where dead-eyed contestants describe getting hit in the face with streams of urine would open you up to lawsuits. Ha ha, it’s funny because Mr. Dithers’s wife doesn’t want to spend time with him! 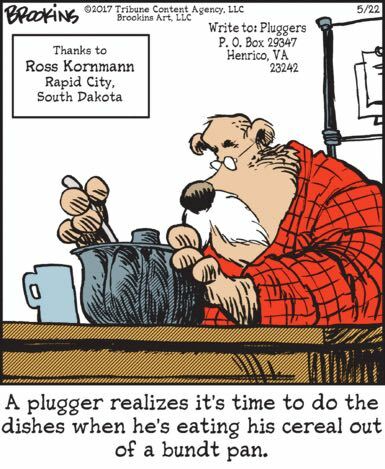 Pluggers’ day-to-day lives involve coming up with coping strategies as their accumulated filth piles up around them. It’s really quite sad!